The Cahill Walk in Sydney is one of the harbour’s most popular walks, despite being virtually unknown. This 2.2km (1.3 mile) urban stroll links Royal Botanic Gardens and Milsons Point to Circular Quay and Sydney Harbour Bridge. The best known and most popular section of the Cahill Walk is the northern end, more commonly referred to as the Sydney Harbour Bridge Walk. While it takes just 45 minutes to do the full path one-way from Milsons Point to the Royal Botanic Gardens (or vice versa), the Cahill Walk is best described in two sections: the northern end of the Sydney Harbour Bridge Walkway, and the southern Cahill Expressway pedestrian path. Tip: Cahill – referring to the walk and Expressway – is pronounced KARL (unlike the Australian footballer Tim Cahill, which is pronounced KAY-hill). Which Direction is Best for the Cahill Walk? The Cahill Walk can be done in either direction, either as a one-way walk using public transport to return to your starting point, or as a there-and-back walk covering the same ground, but offering a different perspective on the return journey. Like the Sydney City Walk, it’s fine to start from whichever point you’re nearest to, and to walk as little or as much as you’d like – there are magnificent views most of the way. Feel free to finish at Circular Quay instead of going another few hundred metres to the Royal Botanic Gardens, or only getting as far as the Pylon Lookout if that suits your day better than crossing the Harbour Bridge all the way to Milsons Point. Starting the Cahill Walk from Macquarie Street, just outside the Northern Depot Gate of the Royal Botanic Gardens, there’s a seemingly mysterious spiral of sandstone blocks. The relics of demolished buildings and structures is actually called Memory is Creation Without End, by artist Kimio Tsuchiya. It is part of the Sydney Sculpture Walk that was installed in 2000. Close up of sculpture Memory is Creation Without End. If you’ve ever caught that first glimpse of Sydney Harbour from Circular Quay train station, then you know the view from the top is special. Up above the train station, alongside the busy Cahill Expressway, there’s a lookout offering even better views over Circular Quay’s ferry wharves and harbour. The view from the Cahill Expressway Lookout is one of the best places to view the New Year's Eve fireworks. But you'd have to be lucky to get through the NYE ballot system that allows you to even purchase a ticket (and it's open to NSW residents only). The lookout – with interpretive signage – also offers the only brief moment of shelter along the Cahill Walk. The first time I continued south from the Sydney Harbour Bridge Walk past the Bridge Stairs on the Cahill Walk, I doubted my choice. A very short stretch of the Cahill Walk is literally right next to the Expressway. I wondered why anyone would choose this concrete walkway next to a seven lane highway over descending Bridge Stairs to wander the historic backstreets and cobbled laneways of The Rocks. Then I rounded the corner and saw the views from the Cahill Expressway Lookout, with photo opportunities that you simply cannot get from street level, and I understood. Rounding the corner of the Cahill Walk, there's a sense of the views you're about to see. It’s fabulous, it’s free, it’s easy. What’s not to love about the Bridge walk? We go into loads more detail (and photos) about the Sydney Harbour Bridge Walk section of the Cahill Walk. Bridge Climbers above and walkers below on the Sydney Harbour Bridge pedestrian walkway. Finishing (or starting) the Cahill Walk at Milsons Point brings it all into context, leaving behind touristy Sydney for a genuinely local flavour… albeit one where many enjoy prestigious harbour views from the suburb next to the Governor-General’s residence at Kirribilli. Still, the actual view is free for all. View of Sydney Harbour Bridge from the end of the Cahill Walk at Milsons Point. to walk across Sydney Harbour Bridge, with non-stop views as you walk towards the Sydney Opera House and city. To do this, get the ferry from Circular Quay to Milsons Point (a train to Milsons Point station gets you to the right place too). From the ferry, walk up the hill (Alfred Street) and just before the train station entry, turn right under the bridge’s cement footing tunnel (Burton Street). The steps up to the Sydney Harbour Bridge, and the start of the Cahill Walk, is here on the corner of Burton and Broughton Streets. Walkers must start the Cahill Walk on this eastern side of the bridge (Broughton Street), as the western side (Alfred Street) is reserved for cyclists. Finish the Cahill Walk wherever you prefer – either as a 25 minute walk to The Rocks, or a 45 minute walk to Circular Quay or the Royal Botanic Gardens. (see below for how to find the elevator/lift at Circular Quay). At the top of the lift, turn right to soon enjoy the Cahill Expressway Lookout, then continue across the Sydney Harbour Bridge until you get to the very end at Milsons Point. At Milsons Point, go down the stairs to exit the bridge, then turn left immediately to pass underneath the tunnel of the bridge’s footings. Turn left onto Alfred Street, staying on the left side of the road (passing underneath the “Luna Park, Olympic Pool” sign) to enjoy Bradfield Park – the grassy expanse underneath the northern end of the Harbour Bridge, with views across the water to Sydney Opera House and the city. Either have a picnic in Bradfield Park, or grab takeaway from one of many cafes in Milsons Point. For a long lunch, go right to the end of Alfred Street for superb views from Ripples, a licensed cafe overlooking the bridge and harbour. Return across Sydney Harbour Bridge when you’re ready. To finish the Cahill Walk, either end at Circular Quay via the lift, or continue a few hundred metres to Royal Botanic Gardens, entering via the Northern Depot Gate. It’d be even nicer to stroll through the gardens down to the harbour, and turning left to come back to Circular Quay past the Sydney Opera House. As described above, there is an access point to the Cahill Walk at Milsons Point. If starting from the city – and if you’re only doing the Sydney Harbour Bridge section of the Cahill Walk – the most popular access point is the Bridge Stairs on Cumberland Street in The Rocks. The Bridge Stairs are between the Glenmore Hotel and The Rocks YHA / Big Dig site. While there’s another set of quite functional concrete stairs one minute further south along Cumberland Street (between The Rocks YHA and Sydney Harbour Bed and Breakfast), the Bridge Stairs are more historic, attractive and spacious. From the top of the Bridge Stairs, turn left for the Sydney Harbour Bridge Walkway, and right for the Cahill Expressway Lookout. There are two new sets of access lifts from Cumberland Street to improve accessibility for people in wheelchairs and people with prams. 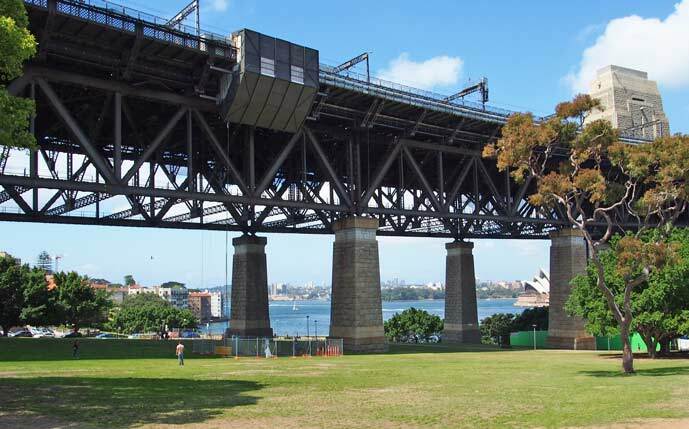 There is also an elevator from Circular Quay, or ramp from the Royal Botanic Gardens (see below). We go into much more detail about walking across the Harbour Bridge here, including more photos from the free walkway, whether it’s worth paying to go up the Pylon Lookout, and about BridgeClimb. There is a lift to the Cahill Expressway pedestrian access from Circular Quay, but it’s easy to miss. Imagine you’ve come out of Circular Quay train station and you’re facing the water. Turn right to walk past all the ferry wharves, with Wharf 2 being the final one. Here, most people are turning left to walk up to the Sydney Opera House, but you’ll keep going straight. The lift to the Cahill Expressway lookout from Circular Quay below. The gelato shop looks across to where you’re going: a yellow and clear glass column. That’s the lift to the Cahill Expressway Lookout. Of course we’re going to say wear comfortable walking shoes blah blah. But please take heed of this one: wear a hat. The Cahill Walk is very exposed. There’s no shade and a lot of white concrete reflecting the Australian sun’s fierce rays. Covering your shoulders (no singlet tops) is good too, again because of the sun. The Cahill Walk is raised well above street level so if it’s a bit breezy below, it’s windy up above. A wind jacket or light layer may be handy on those days. Want more big city sights but in the greenest way possible, keep walking with the Sydney City Walk. Sticking with iconic Sydney, then the Bondi to Coogee Walk is next (or Bondi to Bronte for a shorter walk). Combine the Harbour Bridge with more walks even if you only have a limited time in Sydney. 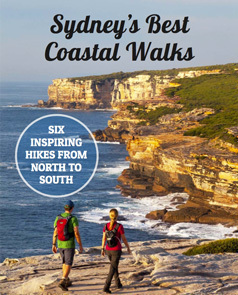 See our itinerary suggestions with 24 Hours in Sydney's Outdoors. Another Sydney must-do is a ferry ride on the harbour. A quick ferry trip from Circular Quay will get you to Watsons Bay for the South Head Walk, or return you back to the city on the Spit to Manly Walk. Tagged Sydney City, Sydney Harbour Bridge, Sydney Opera House.